The Home Instead Senior Care® network is the world’s leading provider of personalized in-home care services. We have over 1,100 independently owned and operated franchise offices worldwide that employ compassionate CAREGiversSM who share our dedication to enhancing the lives of aging adults and their families. Services span the care continuum, from companionship and personal care to specialized Alzheimer’s care and hospice support. Caring for others is part of our DNA, and that includes caring for your career. The Home Instead Senior Care network provides best-in-class training, education, and opportunities for career advancement. It also offers you the opportunity to be part of a supportive family-like culture where you’re encouraged to talk with your local office for support, share stories, and seek guidance. Learn more at www.apassionforcaregiving.com. I got this as my retirement job. There is plenty of work and the schedulers work hard to fit you to a client. I like the flexibility and the opportunity to get shifts whenever I want. Also, pay is not great, but you can make more by picking up weekend or night shifts or taking last-minute fill in assignments. The ability to take time off is important to me. Now that I am retired, I am thinking of traveling and I think it will be easy to arrange with them. As for age issues, I think that can vary by location. Not all HomeInstead franchises are the same. In my case, I see that many of my co workers are also retired like I am. Age is not a problem here. There is plenty of work. I have found a few assignments that suit me completely. I've had a few assignments that did not suit, but i don't have to return to them. So far, HomeInstead has been very good about working with me to make sure I have the right assignments. They are super flexible. I believe that Home Instead is age friendly but to a point. It seems once you are past the age of 55 you suddenly or seemingly are not getting the hours in the you may had been accustomed to when you were just a year or two younger. Many reasons and excuses are given to you for the reduction in hours or sometimes no hours at all. That would be all well and good except when you learn that new and younger people have been hired on given their hours while still at the same time giving no legitimate reasons why the older and more experienced employees are obviously being pushed out if but slowly. Shameful!! When I told the owners how old I was (58), they were very pleased to hear it and told me I had a lot to give with my life experiences, knowledge and wisdom. I was replaced by a younger employee (caregiver) on a client I had for 4 years. I was told I was getting up in age, and may start having difficulty doing the job. and i just turned 64! If you’re looking to work with this company, better be under 50! they are not age friendly. I was hired for part time work with the understanding that I would be offered suitable work with hours between 20-25 per week. This has not been the case however even though I'm available more than 100 hours each week! It seems like they cater more to younger people and more to women then male caregivers which I see as bias. You might have a good schedule for a couple of weeks then a client will pass and then your stuck with less hours for way too long while they"try" to find you someone. I find this very stressful because of the lack of steady work and hours to make ends meet. It's either that they have too many employees or not enough clients to make it a comfortable work environment. Staffing needs much help in order to keep good employees. The training at Home Instead was great but too long. Everyone was so friendly. I was offered an assignment right away but it didn't work out since the client withdrew her request I was disappointed. They told me they would be getting other assignments but they called me about assignments in the morning but I was clear that afternoons was the only time I can work and had it on my record. After that I would call in occasionally with no results. Meanwhile, it has been over 6 months or more since they have contacted me. I had worked once for Visiting Nurses but they no training at all which is why I wanted to stay with Home Instead. HORRIBLE EMPLOYER!! NOT AGE FRIENDLY AT ALL! They understand that older adults actually have a lot in common with those they care for. As an employee of Home Instead, I can say we are very age friendly and accommodating to your other commitments when it comes to scheduling. We have a variety of employees, from students to retirees. We appreciate all of our Caregivers and know how dedicated they are to our clients. The staff is really friendly and nice. They will work with you if you need to rearrange your hours for dr. appointments etc. The only issue I have with them is they need to give raises occasionally. The pay is not that great for what you have to do and how far you drive. I have been working at Home Instead Senior Care part-time (More than 3 years) You can accept only the shifts you can fit into your schedule. There is a lot of work available once the snow birds arrive so you might get a lot of calls. They like to recognize exceptional caregivers so if you fall into that category be prepared for a lot of praise. The office staff is nice. The receptionist is friendly and makes you feel at home. 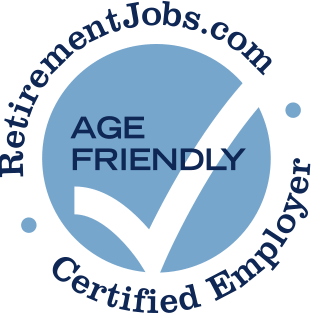 Home Instead Senior Care has been a RetirementJobs.com Certified Age Friendly Employer since 2007. I have a total of 50 years experience and I am Healthy and Active. Home Instead at the location I work is very age friendly. The owner of the franchise and the managers are all over 55 so they realize that life experience is valuable. I am very happy working for them.. I have always been treated with respect by Home Instead. The location I work for is very age friendly as long as you can meet the physical demands of the job, such as protecting clients who may be a fall risk, etc.